Read more via: BBC Landward: "Saving Our Salmon"
The Scotsman: "Scotland’s salmon windfall soars above £1bn, but production set to fall by fifth"
Fergus Sings the Norwegian Blues! "The fish farm industry forms an integral part of Scotland's rural economy – creating jobs and providing capital in some of our most rural communities," crowed Fergus Ewing (Scotland's Minister for the Promotion of Foreign-Owned Salmon Farming) in The Herald (15 October 2018). "So it’s very encouraging to see salmon production value on the increase yet again." "Demand for quality Scottish salmon continues to outstrip supply and the sector aspires to grow to meet demand, but we also recognise the importance of steady, sustainable development," he continued. "These new figures, alongside the investment in tackling emerging challenges give us great confidence in the sector’s ability for sustainable growth over the coming years." Fergus calmly kept the horror story quiet - the new figures forecast a 21% fall representing 39,000 tonnes of lost production in 2018 due to a nightmare combination of infectious diseases and mass mortalities. 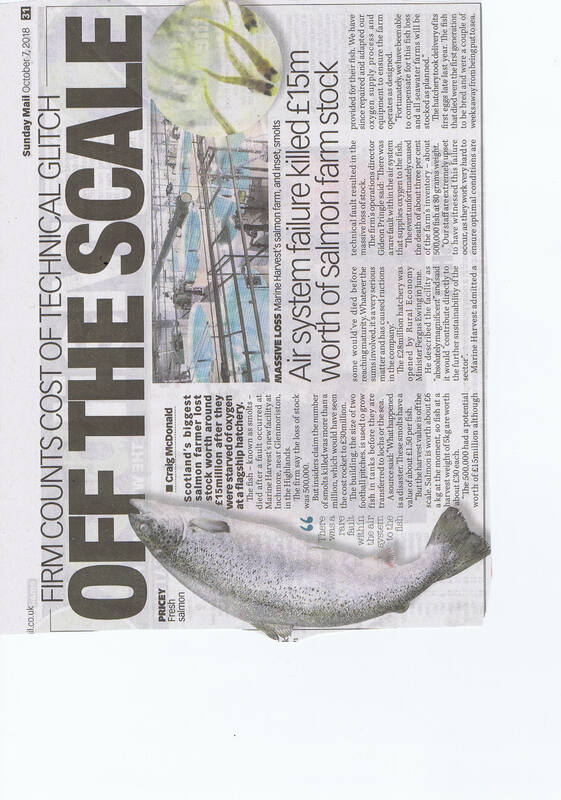 In reality, the Scottish salmon farming industry is dead in the water with over 25,000 tonnes of dead salmon reported in 2017 (an estimated 15-20 million fish) along with skip loads of dead 'cleaner fish'. The new data published by the Scottish Government reveals that the mortality rate in the sea phase of production is now over a fifth - and if you account for the losses in the hatchery the true mortality rate from egg to plate stands at almost a half. Press Release: "The Skinny on Scottish Salmon"
The National: "Concerns raised over Scottish salmon roe imports"
Press Release: "Secret 'Scottish' Salmon"
The National: "Government 'failing to protect Scottish salmon'"
Press Release: "Complete Mockery of the Brand 'Scottish Salmon'"
Private Eye: "RSPCA: Synchronised Swimming"
Sunday Mail: "Off the Scale - Air system failure killed £15m worth of salmon farm stock"
STV News on the "Nightmares" for Scottish Salmon! Times: "Fears for environment as more fish farms fail to comply with standards"
BBC News: "One in five Scottish fish farms 'not meeting standards'"
Read George Monbiot's article in The Guardian via "The RSPCA rescues one seal – and condones the killing of many others"
Read The Daily Mirror on "RSPCA boss lambasted for saying shooting seals is 'humane pest control' - forcing animal-lovers to cancel memberships"
Read more on the RSPCA's seal-killing practices via: "Herald: "RSPCA attacked for fresh support for Scots seal shooting to protect salmon"
Private Eye: "Down on the Fish Farm"
Old Trout lives on in the Private Eye archive! RIP Bruce Sandison - Old Trout is Dead, Long Live Old Trout! A Crowd Justice campaign to fund legal action to stop cruelty and suffering on Scottish salmon farms has been launched. 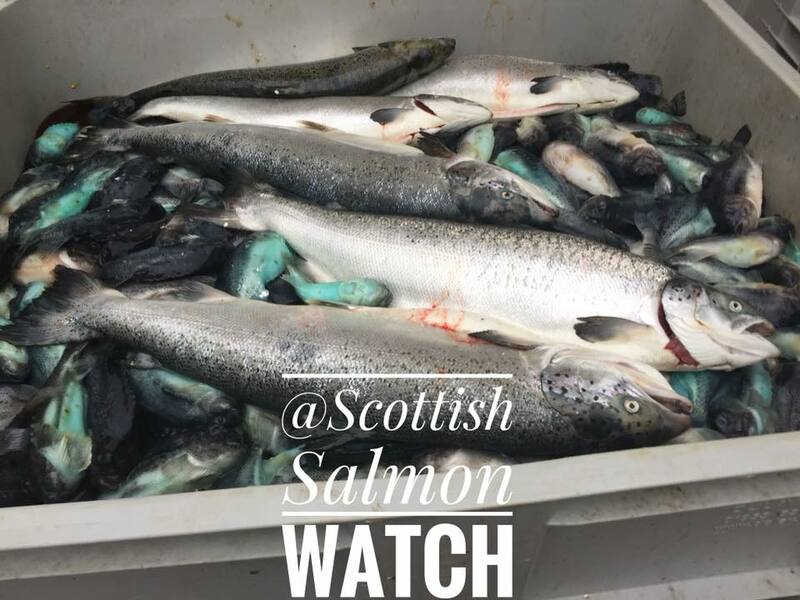 Scottish Salmon Watch is proposing a legal challenge because they believe that salmon farms in Scotland run the risk of breaching the Animal Health & Welfare (Scotland) Act 2006 - specifically in relation to "Unnecessary Suffering", "Cruel Operations" and "Ensuring Welfare of Animals". "Cramming the 'King of Fish' in cramped and overcrowded cages is cruel and a welfare nightmare," said Don Staniford, Director of Scottish Salmon Watch. "Scientific research has shown that salmon are sentient beings who feel pain and distress. Secret filming inside salmon farms reveals shocking suffering on salmon farms. Legal action is urgently needed to raise welfare standards on Scottish salmon's torture chambers. Fish have feelings too but have no voice so we need to speak out on their behalf and stand up against cruelty and suffering on Scottish salmon farms." Download press release via Dirty Rotten Scottish Salmon - Videos lift the lid on can of worms, beetles & maggots!